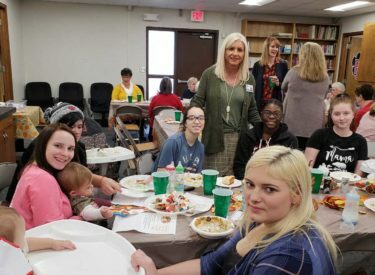 Ponca City School students in the Teen Pep program held their annual Thanksgiving dinner to show their appreciation to everyone who supports them throughout the year. Their Partners In Education, Ponca City Leadership Alumni, helped provide the meal. Pictured back row, from left, Rhianna Costello, Alyssa Norris, Kaylie De La Mora, Superintendent Shelley Arrott, Nijah Johnson and Jayce Jann. Front row, Jaqulyn Stockwell.